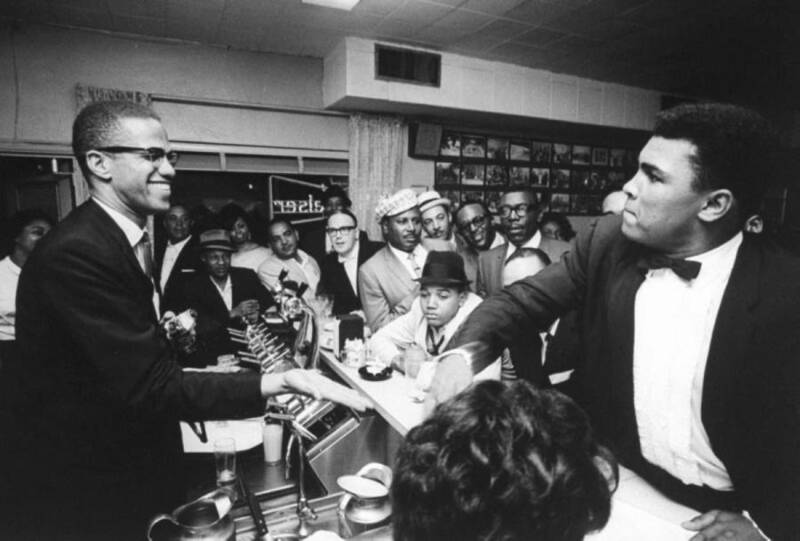 Muhammad Ali and Malcolm X slap hands. 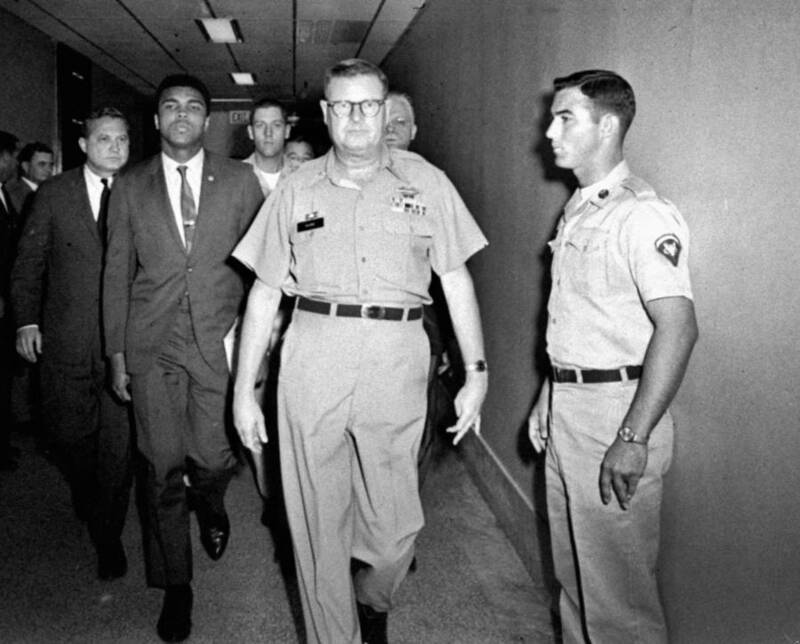 Muhammad Ali is escorted from the Armed Forces Examining and Entrance Station after formally refusing the draft. 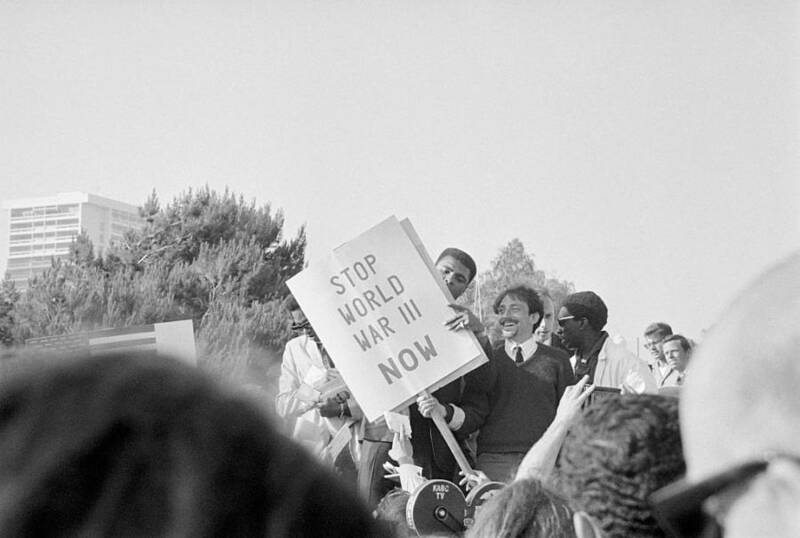 Muhammad Ali holds up a sign that reads "Stop World War III Now," joining an anti-war protest outside of President Lyndon B. Johnson's hotel. After years of legal battles, Muhammad Ali won his freedom and the right to fight again. Here, he walks through the streets with members of the Black Panther Party soon after he was allowed to fight again. A suicidal veteran of the Vietnam War stands poised to jump off the ninth floor of a building. Muhammad Ali calls to him, begging him not to jump. Here, after touching back down on American soil again, Muhammad Ali is embraced by one of the hostages he saved. Muhammad Ali, accompanied by Malcolm X, signs autographs outside of a movie theater. Muhammad Ali watches Elijah Muhammad, the leader of the Black Muslims, speak. 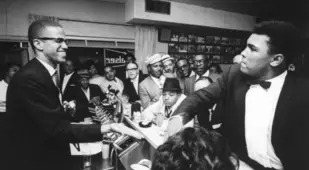 The Black Muslims were slow to accept Ali, but with his growing celebrity and the support of Malcolm X, Elijah Muhammad started to publicly embrace Ali as a member. Muhammad Ali, shortly after finding out that he will be drafted into the Vietnam War, tries on army boots. Muhammad Ali takes to the podium and speaks to an audience of Black Muslims. 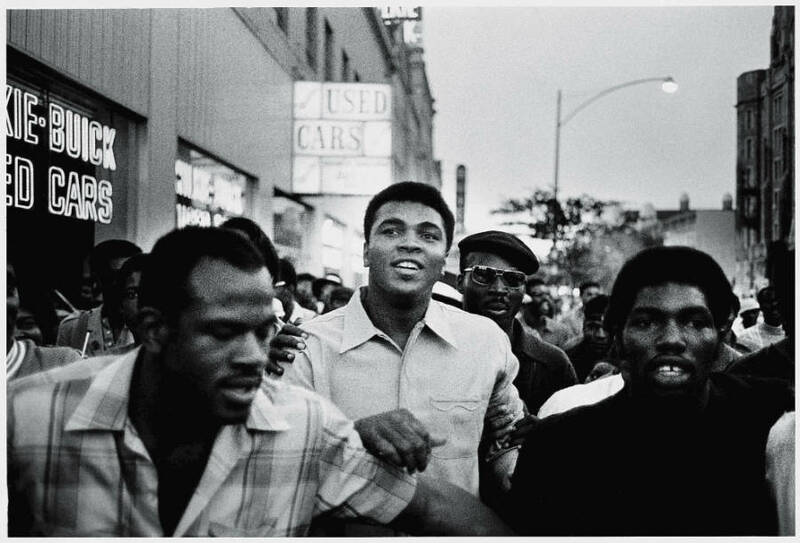 Ali surrounded by supporters protesting both the draft and the Vietnam War. Muhammad Ali finds out that his fight with Floyd Patterson has been cancelled. With all the controversy surrounding Ali's draft refusal, no city is willing to host the fight. 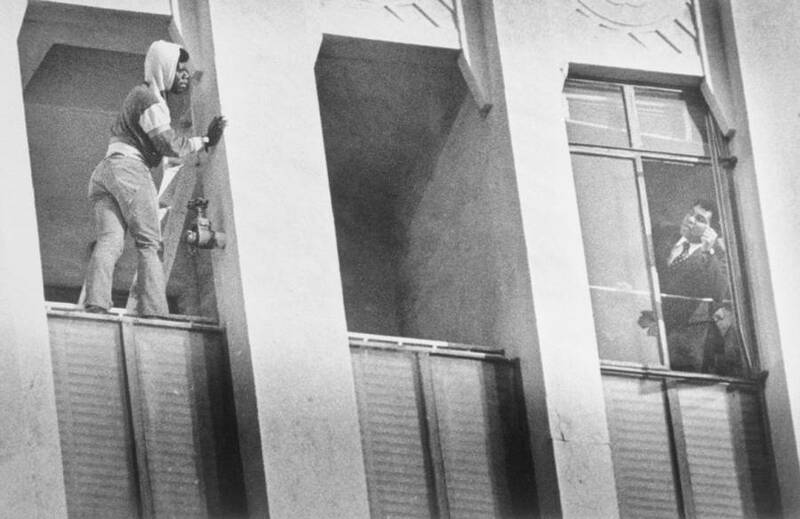 Muhammad Ali talks the suicidal man down from the ledge of a window. Muhammad Ali hugs an injured child, a refugee from war-torn Liberia hiding out in the Ivory Coast. 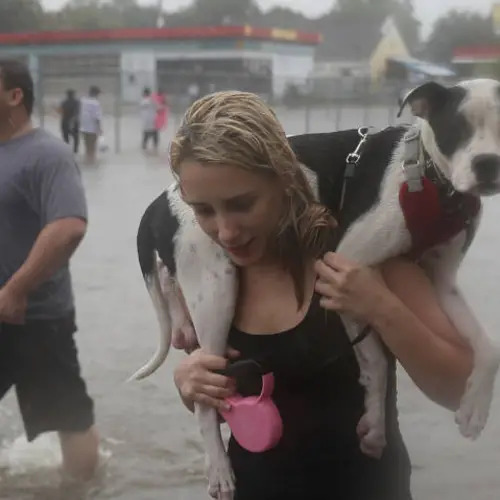 Ali was on hand, helping provide $250,000 worth of relief materials to the refugee camp there. Muhammad Ali sits behind Elijah Muhammad at a Black Muslims event. A crowd big enough to fill a stadium sits and listens to Elijah Muhammad and the Black Muslims. 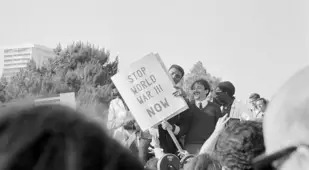 Muhammad Ali steps out of the Armed Forces building and finds himself greeted by thousands of supporters rallying behind his refusal to be drafted into the Vietnam War. After his match with Sonny Liston, Muhammad Ali poses for a photograph with Malcolm X.
Muhammad Ali had just come out to the world as a member of the Black Muslims. His friendship with Malcolm X and his association with the Black Muslims nearly got his fight with Sonny Liston cancelled. While 15 Americans were held hostage in Iraq, Muhammad Ali, without permission from the American government, flew to meet with Saddam Hussein and to negotiate their release. Here, Ali walks through Amman International Airport with some of the hostages just after their release. A group of famous African-American athletes (seated, from left: Bill Russell, Ali, Jim Brown, and Kareem Abdul-Jabbar) gather together to speak out in support of Muhammad Ali's decision to refuse the draft. Muhammad Ali points to a newspaper to show that he is not the only one opposing the Vietnam draft. 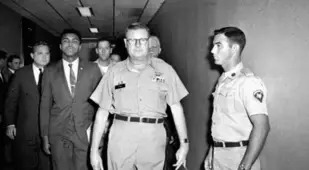 For his refusal to join the Army, Muhammad Ali was stripped of his heavyweight title. Here he speaks before the Illinois Boxing Commission and states that he will not apologize for making so-called "unpatriotic remarks." Muhammad Ali visits the Hussein Mosque in Cairo and joins Muslims in prayer. Muhammad Ali autographs draft cards for his fellow conscientious objectors. Muhammad Ali sits next to Elijah Muhammad during a Black Muslim meeting at the Olympic Auditorium. Muhammad Ali and his attorney, Hayden Covington, file a petition to keep him from being drafted into the Vietnam War. For avoiding the draft, Ali would be sentenced to five years in prison. He would have to take his fight up to the Supreme Court and spend nearly four years outside of the ring to overturn it. Muhammad Ali speaks about civil rights before a civil rights rally. 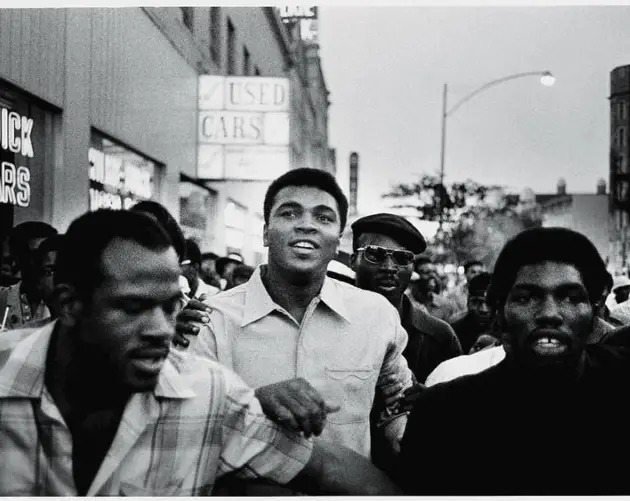 Muhammad Ali joins a crowd of protesters fighting against the sentence of boxer Rubin "Hurricane" Carter, convicted (and ultimately exonerated) of murdering three people despite some of the key witnesses recanting their testimonies. Athletes from Muhammad Ali's amateur sports club lead a protest against the Soviet invasion of Afghanistan. Ali pushed to boycott the Moscow Olympics in protest of the invasion. 50 years after Ali was stripped of his title for refusing the draft and for his involvement with the Black Muslims, the United States' first African-American President, Barack Obama, flips through a book of photographs of "The Greatest." Ali, Obama says, showed him that "nothing is impossible." Muhammad Ali's life forever changed when he won the heavyweight title from Sonny Liston in 1964 – not just because Ali had proven himself to be a champion inside the ring, but because that was when the world found out who the man that they knew as Cassius Clay was outside of the ring. He was, among other things, a Black Muslim, a friend to Malcolm X, and a man who would not stay silent about the things he believed in. Over the ensuing years, Muhammad Ali's life would be full of strife and controversy. Within two years of the Liston match, he would receive a draft notice calling him to fight in the Vietnam War. 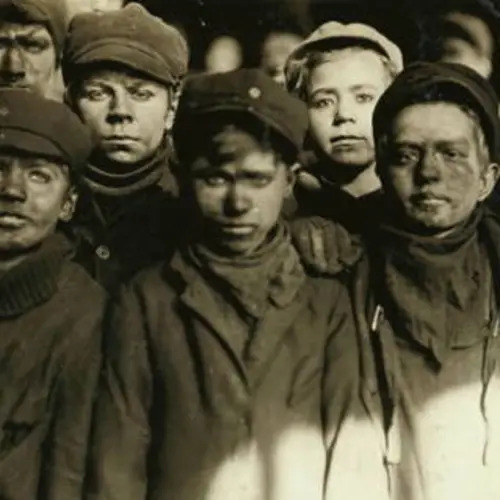 Ali refused, calling the government hypocrites for asking African-Americans who were still fighting for their rights at home to instead go and fight for freedom overseas. His refusal to fight would cost him everything. He was stripped of his heavyweight title, he was barred from fighting in the ring, and he was sentenced to five years in prison. Though he would avoid that time behind bars, it took him the length of his whole sentence to fight it. Ali had to take his case all the way to the Supreme Court in 1971 amid revelations that the FBI had been tapping his phone calls. After the Supreme Court gave Ali his freedom and the right to step inside the ring once more, Ali still kept fighting outside of the ring as well. As various conflicts in the Middle East continued to bubble over, Ali -- as an American, a Muslim, and a celebrated public figure -- had a unique role to play. In 1980, he led protests against the Soviet invasion of Afghanistan, even managing to convince the government of Kenya to boycott that year's Moscow Olympics in protest. 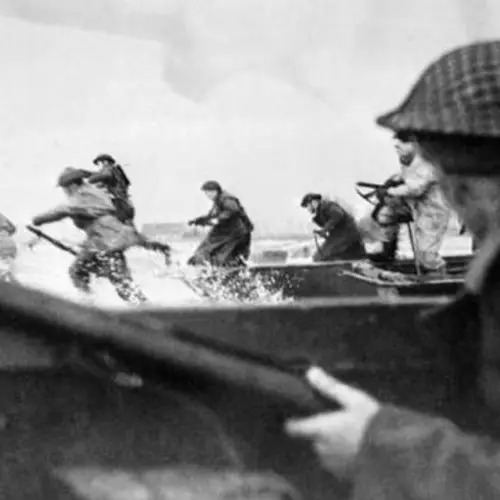 A year later, he would talk a suicidal veteran of the war he’d refused to serve in down from a ledge and see firsthand the effects of the draft he’d fought against. In 1990, as the pieces of the Gulf War were falling into place and the Iraqi Army took 15 Americans hostage, Muhammad Ali – without permission from the government – flew to Iraq and negotiated their freedom with Saddam Hussein himself. It worked, and Ali brought the Americans back home safely. He organized famine reliefs, he helped refugees, and, in his later years, he fought his own personal battles with Parkinson’s Disease. This, however, was one fight that he ultimately couldn’t win. Ali died on June 3, 2016 – but not before helping change the face of America forever. Next, take a look at the most unforgettable Muhammad Ali quotes. Then, check out footage of Ali's most awe-inspiring knockouts.